We see ‘the splash’ making its mark, Willy Wonka scenes brought to life on the runway and geeky Google Glass lovers entering a digital future. Show stopping Parisian shop windows, mirrored universes that dazzle and glow and a transparent sushi restaurant of which acrophobics may lose their appetite. One Artist, One Material: David Quayola creates classical sculptures for the digital age. 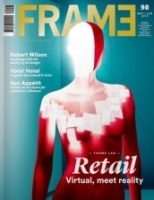 Our first Frame Lab feature sheds light on the retail industry. We show the hottest mannequins in town and experimental indoor environments next to an in-depth analysis based on the views of professionals in the field. Interview with the leading theatre designer Robert Wilson. A case study on Canberra’s cultural catalyst, Hotel Hotel. A look behind the scenes at Gaggenau, German high-end appliances manufacturer. Maciej Karpiak of Nuuun opens up on his kitchen diaries. The making of.. The sculptural spaces of the Modern Art Museum in Bejing.